Bay Cottage01263 715779work01603 870304fax Self-cateringClose to the centre of Wells-next-the-Sea, this charming cottage is just a short walk from the town's shops, pubs, restaurants and busy quayside. The cosy property has been fully refurbished to a high standard and offers a great base from which to explore the Norfolk Coast, using the Coast Hopper bus which stops just 200 yards away. • Other: Linen, towels, books and games provided. Stairs are steep and narrow. Shower room is accessed through the main bedroom. 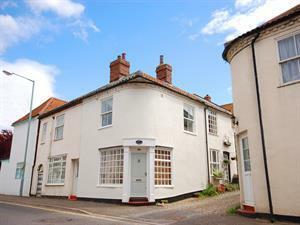 Exterior view of Bay Cottage which is only a short walk from the quay side. Close to the centre of Wells-next-the-Sea, this charming cottage is just a short walk from the town's shops, pubs, restaurants and busy quayside. The cosy property has been fully refurbished to a high standard and offers a great base from which to explore the Norfolk Coast, using the Coast Hopper bus which stops just 200 yards away.